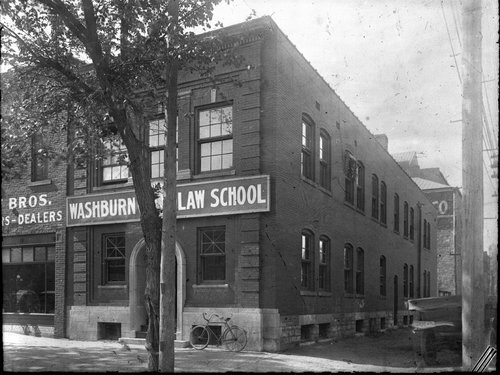 This black and white photograph shows the Washburn Law School in Topeka, Kansas. The school opened its doors on September 17, 1903 at 118 West Eight Street. In 1911, the school moved to 725-27 Kansas Avenue to accommodate increasing enrollment. Within two years the institution was moving once again after Washburn trustees agreed to purchase the Bell Telephone building at 211 West Sixth Avenue. This location was intended to be the permanent home for the law school but due to renovation problems, the school moved to the Washburn Campus, in 1918, and into the basement of Crane Observatory until future accommodations could be made. A bicycle is visible outside of the building.